Portland, OR – June 19, 2018 – (GuitarPR) – McSwain Guitars will introduce the Red, White & Bullets “Model T” Guitar and companion wall mount as part of the Boutique Guitar Showcase at the Summer NAMM Show in Nashville, June 28-30 2018. 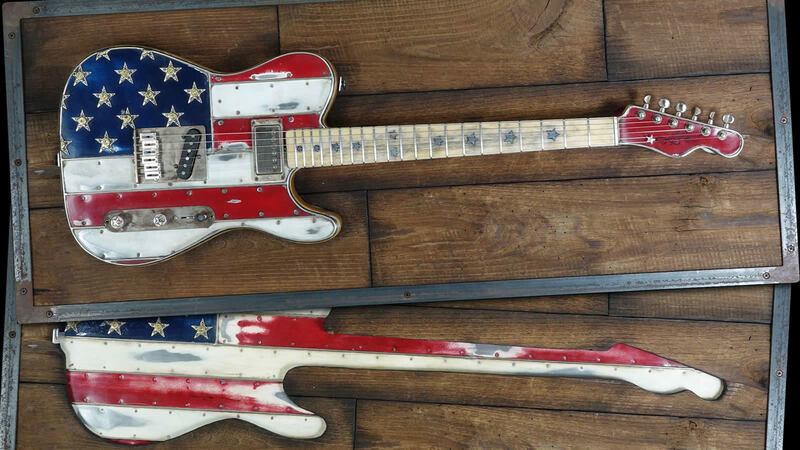 “Our signature Red, White & Bullets design has been incredibly popular with our customers and we wanted to extend that product line with a new vintage-inspired body and neck profile we call the Model T,” said Stephen McSwain, Founder of McSwain Guitars. The initial limited release of the Model T will include a newly-designed Red, White & Bullets wall mount display. The Model T Wall Mount features a distressed steel frame, genuine reclaimed wood and Model T cutout with a matching Red, White & Bullets inlay. “Our wall mount design serves as both the perfect display for the Model T as well as a unique piece of standalone art.” McSwain added. McSwain Guitars is a leading manufacturer of custom electric guitars in Portland, Oregon. The McSwain team brings handcrafted design to a diverse range of electric guitar models distributed globally through high-end, boutique dealers and direct sales. Prior clients have included a range of iconic guitar players such as Slash, Vernon Reid, Scott Ian and Tak Matsumoto.